Yee Jee Tso was born in March 1975. He was born in Hong Kong but his family emigrated with him to Canada when he was only six months old. In 1991 he played the part of Jock in the 1991 television series Fifteen and between 1994 and 1995 he played the part of Grant Wong/David Twister Wong in 11 episodes of the television series Madison. 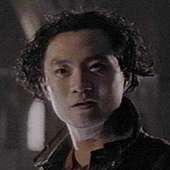 After playing the part of Chang Lee, in the 1996 Eighth Doctor film "Doctor Who: The Movie", Yee Jee Tso's Doctor Who connection continued when he played the part of Doctor Reece Goddard in the audio/webcast "Real Time" produced by Big Finish Productions, and the part of Major Jal Brant in the audio drama "Excelis Decays" both in 2002. Since then Yee Jee Tso is known for his work on Antitrust in 2001, where he played the role of Teddy Chin, Impact in 2009 and 50/50 in 2011. His other television roles include guest appearances on Sliders (1995), The Outer Limits (1997), Stargate SG-1 (2001), Battlestar Galactica (2005), Stargate: Atlantis (2007) and Alcatraz (2012). Although his contact with The Doctor was only brief, Chang Lee was nevertheless a key player in what appeared at the time to be The Doctor's final encounter with The Master, even if Lee spent most of this time on the wrong side after being manipulated by the dying Master. An Asian-American gangster in San Francisco in 1999, Lee's parents were industrious, law-abiding shop owners, but his older brother, Chang Ho, wanted to use their shop as a front to sell drugs for his gang. When their parents refused, the elder Changs were killed by a rival gang, forcing Lee to join Ho's gang even after Ho was killed in 1996. With nothing else to do with his life, Lee remained in the gang until December 30 1999, when he and a few friends were surrounded by a rival gang in an alley. Although Lee's friends were killed, Lee was saved by the fortuitous arrival of the damaged TARDIS, which materialised between him and the rival gang members before they could shoot him the gang expending most of their bullets on the TARDIS and their last few rounds on the Seventh Doctor as he left the ship. With the gang having fled, Lee called an ambulance to take The Doctor to hospital - signing him in as 'John Smith' - but when The Doctor 'died' on the operating table, Lee stole The Doctor's things and fled. Confused at The Doctor's possessions - which included a yo-yo, the sonic screwdriver, and the TARDIS key - Lee returned to the alley where he had witnessed the TARDIS materialise and entered the ship, just in time to meet The Master, who had hi-jacked the body of the paramedic who had taken Lee and The Doctor to hospital. Winning Lee over by promising him wealth and power, offering two bags of gold dust from the TARDIS as a downpayment, The Master claimed that The Doctor - who had actually regenerated the previous night, his regeneration delayed due to the anaesthetic in his system - had actually stolen his body and the TARDIS from The Master, manipulating Lee into helping him track The Doctor and open the Eye of Harmony, Lee unaware that opening the Eye would destroy Earth. Although The Master's initial attempt to capture the Eighth Doctor failed, resulting in The Doctor managing to acquire a vital component to repair the damaged TARDIS, Lee's knowledge of the city streets allowed him and The Master to reach the TARDIS first, catching The Doctor off-guard. Even after The Doctor was captured and new companion Dr Grace Holloway fell under The Master's influence, he continued to try and reason with Lee, insisting that the TARDIS and his body were his own and The Master was the true liar. Although The Master claimed that he would take Lee with him as his own companion, The Doctor knew that The Master was lying, eventually tricking The Master into incriminating himself when The Master proclaimed that The Doctor had made him waste all of his lives when he had earlier claimed that The Doctor had stolen them. When Lee realised the truth, The Master casually broke his neck and continued with his plan, only for The Doctor to undo the damage caused by the Eye being opened and hurl The Master into the Eye. With the effects of the Eye undone and Earth restored, The Doctor was able to reverse time with the TARDIS and restore Lee and Grace to life, subsequently returning them to Earth just after midnight on January 1 2000. Although Lee returned The Doctor's things to him, The Doctor assured Lee that he could keep the bags of gold dust, simultaneously advising him to take a Christmas vacation, Lee departing with a parting comment that he would see Grace around ("Doctor Who: The Movie"). Although it has not been specifically stated, it would appear that Change Lee went on to become a major figure in future space projects. When the Fourth Doctor and Sarah Jane Smith discovered a UNASA spaceship drifting out of the solar system in 2040 (Albeit a spaceship where the astronauts were being watched as a reality show as part of an attempt to gain funding), Chang Hu, the leader of the expedition, mentioned that his father invested in the space program when a stranger gave him a bag of gold dust at the turn of the millennium, making it likely that he was Chang Lee's son after his father was inspired by his time with The Doctor ("Observer Effect").